When you’re part of an internationally famous band, it’s inevitable that you’ll be required to learn a few foreign languages, just enough to interact with fans on your tours to various corners of the world. With that in mind, the 11 members of popular K-pop boyband Wanna One arrived in Malaysia armed with Malay phrases to confidently shout out to their Malaysian Wannables. 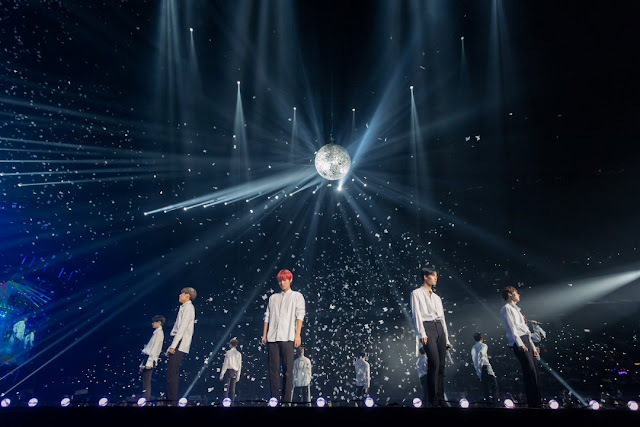 Wanna One touched down in the Southeast Asian country last weekend for their “Wanna One World Tour <ONE THE WORLD> in KL” concert, held on 21 July at Axiata Arena, Bukit Jalil. 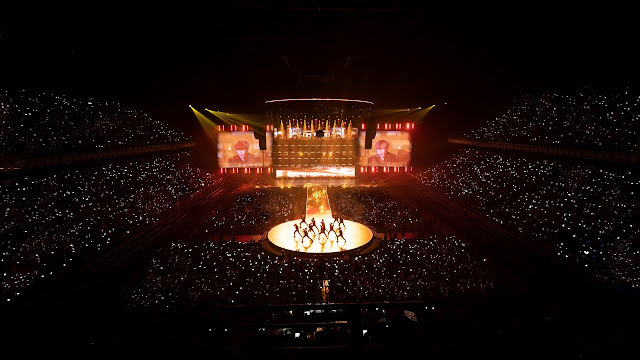 They had previously held a showcase in the country in January this year but this time, they were back for their first ever concert in KL, which was a bigger and grander affair than their last event. With blue and purple lights flooding the stage, the idol group, decked up in white suits, appeared on stage around 8pm and kicked off their concert with one of their older hits, “Burn It Up”, quickly followed by two more songs off their first album, “Never” and “Energetic”. Right after the third song, the group rushed off stage but member Hwang Min-hyun returned a moment later to perform his solo dance stage – it involved a blindfold and lots of screaming fans. One of the younger members of the group, Bae Jin-young, also performed a solo dance after his hyung. He was then joined on stage by Lee Dae-hwi and Park Ji-hoon, the other two members of No. 1, the first of Wanna One’s four subunits to perform that evening. Confetti occasionally fell from above, creating a wonderful effect during the performances. After No.1’s performance of their song “11”, Min-hyun took to the stage once again, this time with leader Yoon Ji-sung and fellow vocalist Ha Sung-woon. The trio, comprising the subunit Lean On Me, sang their song “Forever and A Day”, bathed in golden lights that lent their stage an ethereal look. Park Woo-jin and Ji-hoon did a dance battle before the others joined them for “Boomerang”, everyone now wearing sleek black suits. Despite their laboured breathing after performing the song’s intense choreography, the 11 members were all smiles as they finally greeted the 8,000-strong crowd, which never ceased screaming, by the way, since the concert started. After expressing their happiness for being able to see their Malaysian Wannables again and hoping that everyone would enjoy the show, the concert continued with rain suddenly pelting the screens around the stage. The rain effect added a romantic touch to the band’s performance of “Beautiful”, which ended with a solo dance stage by Kang Daniel. 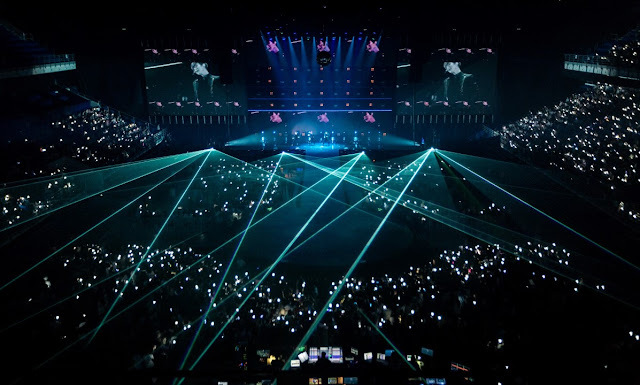 The white glow from the Wannables’ light sticks filled the entire arena throughout the concert. Then came the time for Wanna One to show off their linguistic prowess. This being the band’s second time in Malaysia, they were perceptibly more comfortable and confident. “As a gift to Wannables, let’s say these in Malay,” said Daniel. Ong Seung-woo and Ji-sung continued with passable pronunciation of their chosen phrases (“Memang terbaik” (definitely the best) and “Awak boleh!” (you can do it) before Woo-jin, looking nervous, quickly mumbled his lines, prompting laughter and teasing from the others. “Awak boleh bertahan, fighting!” Min-hyun, showing off the best pronunciation among the lot, helped him read the prompter. Lighting played a huge part in creating the concert’s futuristic ambience. After the amusing interlude, the show continued with Seung-woo and Dae-hwi performing their subunit The Heal’s song, “Hourglass”. Fittingly, an hourglass adorned each of the boys’ mic stands. The final subunit, Triple Position, consisting of Daniel, Jae-hwan and Woo-jin, hyped up the crowd with their catchy number, “Kangaroo”. 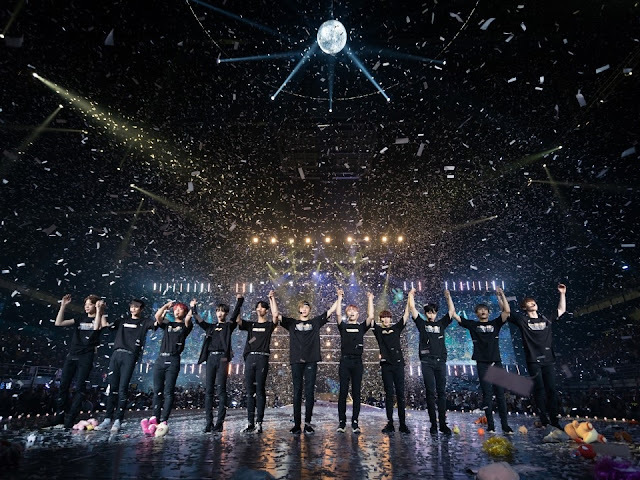 The party was only getting started, as Jisung made his appearance as DJ Hankki, joined by Dae-hwi and Jin-young before the two maknaes were replaced by Sung-woon and Lai Guanlin, who each performed a solo dance stage before the whole band returned for more songs. While performing “It’s Me (Pick Me)”, otherwise known as “Naya Na”, one of their final songs of the night, fans started throwing plush toys on stage for the boys. At 10.15pm, after the group said their good nights and went backstage, shouts of “Encoure!” started reverberating around the stadium. Huge smiles adorning their faces, the band re-appeared, wearing matching black shirts that had their tour name emblazoned across the chest. “Terima kasih datang!” They shouted as they thanked their fans for coming. It became quite an iconic, if somewhat awkward, phrase as the translation omitted the word “kerana”, turning the phrase “thank you for coming” into “thank you coming” instead. Still, with the band’s energetic effort in making the tour as memorable as possible for the local fans, it was a commendable attempt at the national language. Fittingly, Wanna One sang “I Promise You (I.P.U. )” as their last song, after promising that they would return for another concert in future. Thanks for the great information you have provided! I would like to thank you for the efforts you have made in writing this article.Cheers for sharing with us your wonderful blog.